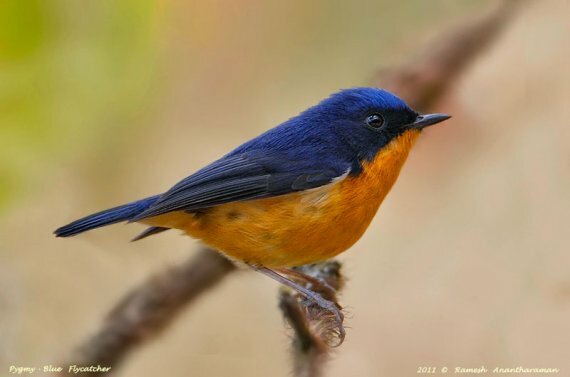 Sikkim is a nature lover’s paradise and, with more than 550 species, a birdwatcher’s dream. Set in the eastern Himalayas, this primarily Buddhist Indian state extends from the foothills to some of the highest reaches of the Himalayas, with habitats varying from moist deciduous forests to alpine meadows, snow-clad peaks and high-altitude deserts. As in other parts of the Himalayas, the climate is highly variable. It can rain or be nice and sunny at any time, with extremely cold winters. This makes it testing for the photographer, as the lighting and weather conditions are similarly unpredictable. But many a time the birds do oblige. Sikkim - foothills and high mountaintops. This winter was not great for me as a bird photographer. I had not made any major birding trips. I had reached a kind of desperation and my right index finger was itching to work on the shutter of my camera. Then the opportunity for a week-long trip to Sikkim came by! We covered just a few places around the south and west of Sikkim, mainly ranging in the altitudes of 1400m to 3000m. The forests here are mainly of moss-laden oak and sal trees, and the bird diversity is stunning. 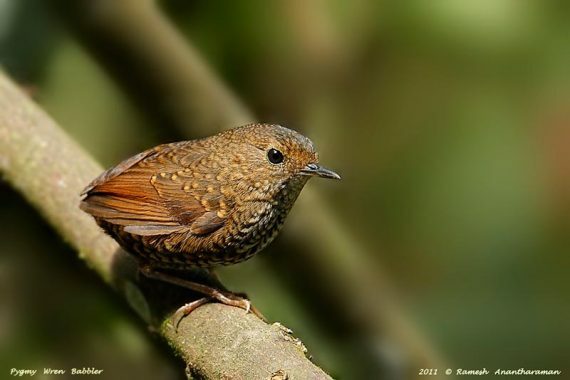 One day on our trip, we had already seen and taken nice photos of Pygmy Wren Babbler, and were visiting the edge of a lake in western Sikkim, hoping to photograph Black-tailed Crake. My dear friend and guide Chewang Bonpo and I were scuttling around the edge of the lake, trying to find a good spot with the best light, and where we could wait in relative comfort, perhaps for a long time – the Black-tailed Crake is a very shy bird. We came across a large oak tree root, which had a depression behind it. This seemed to be a good place to stay put and start the waiting game for the crake. The sun was right behind us, and everything was painted beautifully by the light, with the large root acting as perfect cover. We succeeded in spotting the crake, but it would not come out of its hideout of reeds and bamboo clumps. Then, suddenly to my right, a small dark shape hopped out of the dense reeds towards us. Chewang suddenly grew restless, and I could see tension on his face. Whispering, he urged me to at least get a record shot of the bird. All he said was that it was something rare. I took a few shots. The bird kept staring at us, but was continuously hopping around the reeds. We sat extremely still and quiet; my hand began to ache, as my 500mm lens felt like a ton now, because of the tension in the air. All of a sudden the bird popped out onto a broken bamboo twig. This was any bird-photographers dream. Green background, perfect light, a natural perch, and a wild bird sitting in the open! I focus-locked and the let the shutters go like a bullet. Satisfied, I stopped and looked at poor Chewang, who was trembling with excitement. 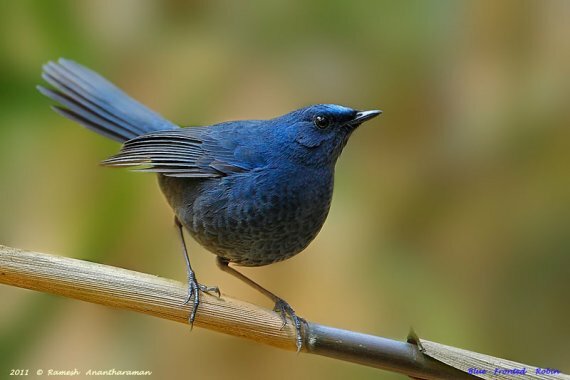 He told me that what we had just seen was a Blue-fronted Robin Cinclidium frontale, that this was the first time he had had a good view of the bird, and that this was probably the first time the bird had been photographed in the open, wild and free. He told me that people have spent months on its trail just to get a distant half-glimpse of this shy, shy fellow. Only then did the whole scene started to sink in, and I was left breathless and astonished at what nature can throw at us. We had to come out of our spot behind the root for a bit of fresh air. The excitement had been too much for us. So there we go. The inside story of the finest photograph ever taken of this species, the most elusive in Asia. You can see more of Ramesh’s stunning photography here. the images from your Sikkim trip are some beyond words to describe. You have some of the best images of most of the species photographed by you. keep up the great work and wish to see a lot more of your brilliant work. Also after having known Ramesh personally I have come to understand that he is a selfless person. He is a very unusual photographer who not only shares his knowledge with others but also appreciates you if your work is good, this character is very rarely found in many of the photographers. RAMESH VARUN AND CLEMENT have taught me soo much in photography that I owe them all a very big thanks. Once again I congratulate Ramesh for a job really well done. 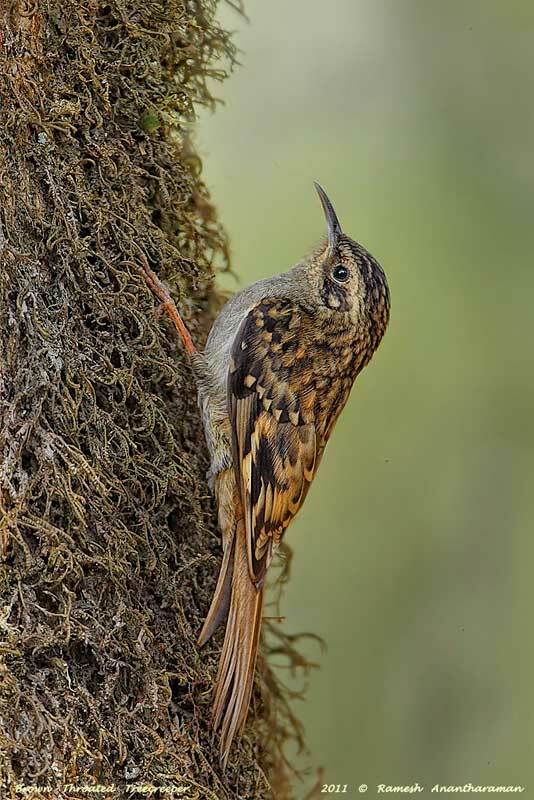 Ramesh very well written, Great Bird Pictures especially image of Tree-creeper is out of world, mindblowing.